The MBCM401UV3-IR is 4 Megapixel Near Infrared (2048 x 2048) USB3 Vision compliant camera with a 1″ CMOSIS Sensor capable of frame rates up to 89 Hz. It has a compact rugged design measuring 28mm (W) x 28mm (H) x 40mm (D). SenTech USB3 Vision cameras feature Pleora drive hardware providing compatibility with a wide variety of software applications. Windows and Linux drivers and SDK are available in the document section below. 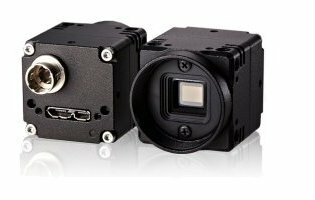 The MBCM401U3V-IR Near IR Camera features a 1″ CMOSIS Sensor with a 20248×2048 pixel array capable of full frame rates of 89 Hz. It has enhanced near IR response from 680nm to 1000nm. and an ultra compact design measuring just 28mm (W) x 28mm (H) x 40mm (D). SenTech USB3 Vision cameras feature Pleora drive hardware providing compatibility with a wide variety of software applications and drivers. Optical Center Accuracy Positional Accuracy in H and V directions: +/- 0.31 mm, Rotational accuracy of H and V: +/- 1.5 deg.